The VFO knob can be generally used for tuning but there are a few other tuning aides. Touching the MHz digits on the frequency display brings up the Band Stacking Register feature screen. This will allow you to quickly change to another band or directly enter a frequency. If you “long touch” a band key on the screen you rotate through various sections of the band like CW, SSB, etc. Touching the kHz digits lets you change the tuning step size and touching the Hz numbers lets you activate the fine tuning feature. Changing modes can be quickly done by simply touching the current mode on the screen. This will bring a panel on the screen with buttons for selecting a new mode. With the spectrum / waterfall display active, you can tune to any active frequency by touching the waterfall. Icom uses a clever trick to help you work with the small display. When you touch in the general area of the waterfall of the signal, a magnified area will pop up on the screen to you more accurately select the active frequency. However, depending on your accuracy you may still have to reach over and grab the VFO knob to touch it up a bit. The spectrum scope makes it easy to see active frequencies within the band you are using. No more endlessly spinning the VFO knob hunting for active frequencies. The Icom-7300 makes getting around the dial fast and efficient which should be a plus for contesters. program a custom Band Edge in just to show the range of a given band they are allowed to transmit in. The IC-7300 comes with three different edges for each band already programed in. Another setting you may want to look into is the REF setting. This allows you adjust the sensitivity of the scope to just display very strong signals or help display weaker signals. There are other tweaks to the scope that can be found by holding the Expnd / Set button under the display. You can tweak several things here. Don’t hesitated to experiment because on most of the settings you can “long press” the menu item and set it back to the factory default. Want a hotter scope? Experiment with the Grid setting. Like funky day glow colors on your scope? Fool around with the various scope color settings. There are also other settings that control how the frequency marker behaves you may want to look into. One cool feature is that you can set the power button when quick pressed to take a screenshot that is stored as a .png or .bmp on the SD card. Handy for sharing some interesting moments. The Sherwood test numbers show that the sensitivity and adjacent channel rejection of the IC-7300 are top notch. Even approaching transceivers or besting transceivers that are 2 to 3 times more expensive. The IC-7300 has a very low noise floor helping to make it a nice quite receiver. The selectable filters are handy for reducing any nearby interference. The Twin Pass Band filter can also help further in reducing interfering signals. The adjustable Noise Blanker can help deal with some types of electrical interference. 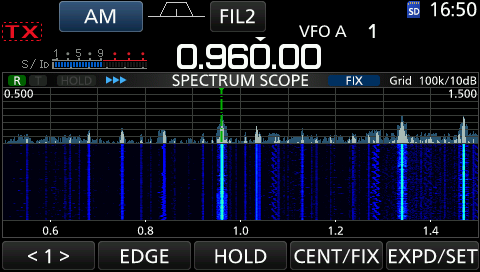 The Noise Blanker in the IC-7300 is excellent. With judicious use of the adjustable Noise Blanker you can significantly reduce background noise without completely destroying the quality of the audio signal. The IC-7300 Noise Blanker doesn’t have that watery sound or echoey sound that so many Noise Blankers produce. When adjusted properly the IC-7300’s Noise Blanker can actually add to helping copy a weak signal. It’s even pleasant enough to leave on full time. The recovered signal audio quality from the IC-7300 and it’s built in speaker is superb. 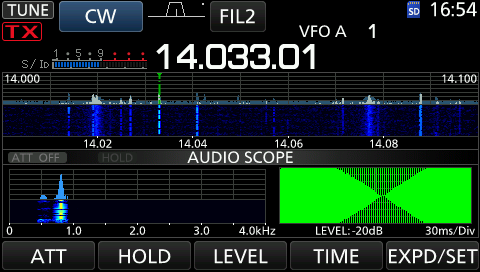 The audio is very full and rich when listening to a well adjusted SSB signal making the IC-7300 very pleasant to listen to and non fatiguing over long listening sessions. 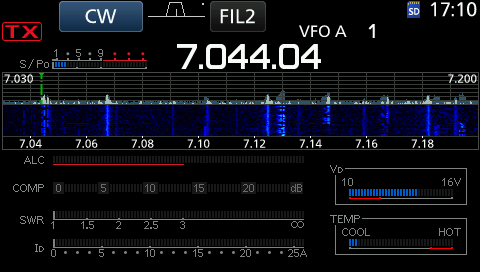 The IC-7300 makes it a real pleasure to listen to a well adjusted SSB audio signal and a real pain to listen the ones that are not (it;s surprising how many or not). This is not always something you find even on more expensive sets without the use of an external speaker / audio system. Listening to AM or Shortwave broadcast is also very nice which may make the IC-7300 appeal to the SWL crowd. This is all without adjusting the Treble and Bass settings found in the setup menu. For now, the IC-7300 is probably one of the best HF receivers you can get your hands on for the price.